Your favorite Pumpkin Spice Latte is back! Available now is the Pumpkin Spice Latte, Salted Caramel Mocha, and their New Toasted Graham Latte. Your favourite fall latte is back. Let the flavours of pumpkin and spice remind you why you love this season. 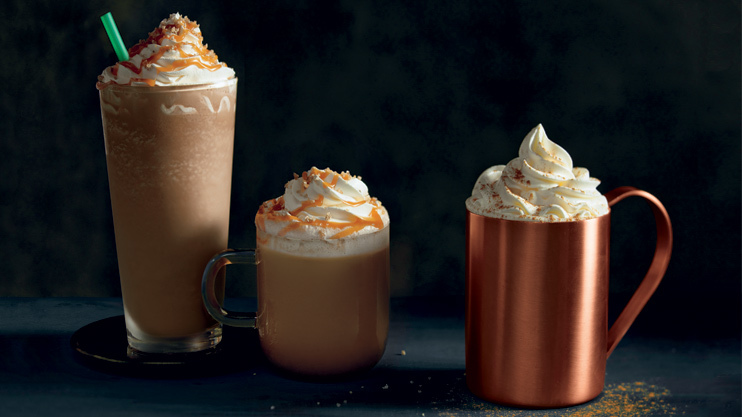 Nothing says "yay fall" like the flavors of our delicious Pumpkin Spice Latte, our delightfully balanced Salted Caramel Mocha, and our new Toasted Graham Latte made with graham and sweet cream. Each can be served hot, iced or blended to suite whatever type of autumn day you're having.